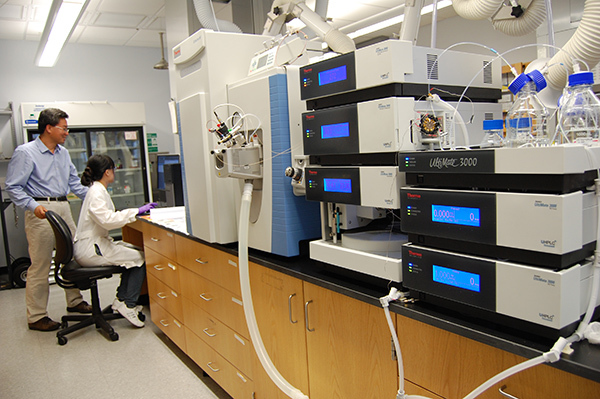 The mass spectrometer is complementary to the center’s existing analytical capability and will be integrated with the existing comprehensive two-dimensional gas chromatography mass spectrometry (GCxGC-MS) platform. 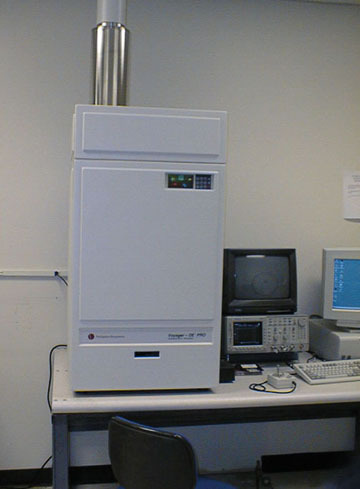 The liquid chromatography part of this instrument dramatically increases the separation power by at least five-fold and will detect low abundance molecules in complex samples. The mass spectrometer part of this instrument has excellent mass accuracy (< 1 ppm) with high mass resolution (R= 240K). Its MS/MS scan speed is up to 18 Hz, and has the capability of polarity switching within one second. The department has acquired a PE Biosystems Voyager DE-Pro instrument for measuring molecular weights and obtaining other structural information. Thermo LTQ-FT, which is an ion trap MS interfaced to a FT-ICR-MS with CID, ECD, and IRMPD dissociation modes, with sources such as ESI, nanospray (including the Nanomate) and Mass Tech AP-MALDI-PDF.